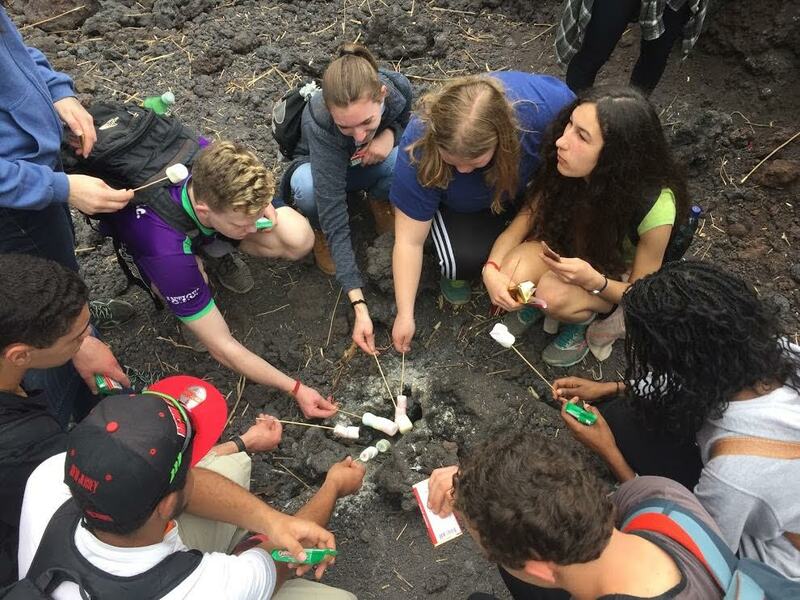 A group of 12 ARHS students spent an adventure-filled February break in Antigua, Guatemala. They left on February 15 and returned on February 24 and were accompanied by ARHS Spanish teacher and study abroad coordinator Eva Piccozzi and English teacher Christen Herland. Ms. Piccozzi has led five of these trips over the past seven years; Mr. Herland has joined on three. The 12 students on the trip were Theo Bellak, Julia Jemsek, Jack Swanson, Isaiah Meade, Angela Oldham Barca, Kayara Hardnett-Barnes, Sadie Blumenfeld, Eric Thompson-Martin, Sasha Zeidenberg, Rafael DePillis, Sam Jackson, and Shannon Sullivan. The students stayed in pairs with host families in Antigua. They ate all three meals with their families. “It was a great opportunity for them to become immersed in Spanish,” said Ms. Piccozzi. Jackson agreed, noting that the people were “friendlier and more connected to the world around them than people in the U.S.” He said because there were fewer cell phones, people were more social and less distracted by technology. Between meals, the students gathered and went on excursions, volunteered at schools, and took Spanish, cooking, and salsa classes. The first four days of their trip were packed with adventures throughout Guatemala. The trips and much of the volunteer work were organized by Impact Hub, an organization that works with entrepreneurs in Guatemala to help them start businesses and improve the economy. They visited a small farmer-operated coffee plantation and learned to make pepian, the national dish. They participated in the entire process, including the first step of killing the chicken. “That was the most memorable part of the trip,” said Bellak. On their fourth day in Antigua, they hiked Volcan Pacaya, an active volcano, which was Jackson’s favorite activity. When they got to the top, they roasted marshmallows. “The majesty of the marshmallow was elevated by our heightened elevation,” said Bellak. The students spent their last four days there volunteering at a school called Escuela de La Esperanza, an NGO in Jocotenango. The school is run by charities and the local students are sponsored to go there. ARHS students were paired up in different classrooms of varied grades and subjects. “It was profound to see how similar Guatemalan children are to American children,” said Bellak. The first three hours of their day were spent at the school. “The teachers were so appreciative of having help,” said Ms. Piccozzi. “We helped them in any way we could,” added Blumenfeld. Students then returned to their host families to eat lunch. After that, they all gathered in a courtyard for four hours of conversational Spanish classes. “I don’t feel like my Spanish necessarily improved, but it was useful to be forced to apply what I had already learned,” said Bellak. All of the students on the trip are required to have taken at least Spanish 4. According to Ms. Piccozzi, students applied for the adventure in May of 2016, which included writing an essay explaining their reasons for wanting to go, attending five meetings throughout the year to learn about Antigua’s culture and history, and saving money for their travels.